Joshua Alexander’s new book, Legends of Illandria: Road to Heravon - Volume 1, ($15.99, paperback, 9781498401104; $25.99, hardcover, 9781498401111; $7.99, e-book, 9781498401128) tells the story of a fictional land called “Illandria™” – a land where a person’s heart is judged and a purpose is given. 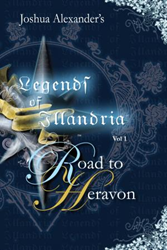 This first installment, Volume 1 Road to Heravon, sets the tone for Illandria™ and all its inhabitants, as they journey to reach their destiny and everything that comes with it from The Source. This is a world where The Source reigns supreme and His guardians, the Ancients, endowed with great gifts and powers watch over the land, leading all the inhabitants in the ways of the Seven Great Books of Illandria. In this powerful series, the legends reveal the character of what it truly means to exist and live but not without a price. It is a fantasy world, engulfed in a mysterious journey as the Ancients bid the provinces to a convocation of great importance in the city of Heravon. What they discover along the way will forever change their existence. Join Yasha, Sanbae, Earos, Protixca, Baryon, and Kietla, as they encounter the Legends of Illandria™ – awakening from their slumber on this epic journey and adventure. Joshua Alexander is the author of the self-help annotation series: Annotations of the Mind, and Annotations of the Heart's Cry: Man's Secrets. He is also the host of Joshua's RC Show at Christian Talk Radio. His talent as a creative and imaginative writer comes from an extensive background in image consulting, singing, dancing, acting, music, national and international modeling, fashion, interior, web, and graphic design, engineering, world travels, and a deep Christian faith. For over 14 years, he has worked with the youth globally, inspiring them to reach their greatest potential and change their lives by being an example and motivational leader. For more information about this author or his outstanding books, please visit his website: http://www.JoshuaAlexander.info. Xulon Press, a division of Salem Media Group, is the world’s largest Christian self-publisher, with more than 15,000 titles published to date. Retailers may order Legends of Illandria: Road to Heravon - Volume 1 through Ingram Book Company and/or Spring Arbor Book Distributors. The book is available online through xulonpress.com/bookstore, amazon.com, and barnesandnoble.com.